In celebration of the diverse range of skills within our Fashion programme, we have commissioned a series of designer profiles from our second-year BA Fashion Journalism students. Showcasing the art of fashion designing and fashion writing, each profile will provide an in-depth insight into the work and inspirations of a selected graduating designer. Here Kate McCusker profiles BA Fashion: Fashion Design Menswear student Dominic-Afsheen Akhavan-Moossavi, whose collection will be on view at Degree Show Two: Design from 20–24 June 2018. Anyone who saw Dominic-Afsheen Akhavan-Moossavi’s graduate collection at the Central Saint Martins internal show remembers it. 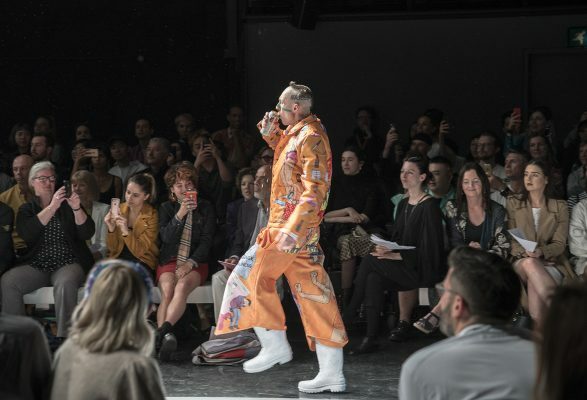 Call it the one where the models ran riot to Iggy Pop’s Lust for Life, squaring up to the audience and cracking open cans of Stella on the catwalk. “I can’t stand watching models just walking up and down on the runway,” says the 23-year-old North Londoner. “I find it so boring.” The menswear designer’s runway show was many things – disconcerting, irreverent, funny, cinematic – but boring it was not. There’s a personal reference behind every print in his collection: spanning the third triptych a string of bunting reads, “Happy Birthday Dominic-Afsheen Akhavan-Moossavi”, drawn from the memory of his father putting up bunting every birthday morning as he was growing up. Born and bred in London, his father, a coach and motivational speaker, is Iranian and his mother, a midwife, is from Nottingham. Bottles of Aperol, printed on circular leather bags to be worn around the wrist or clipped onto belt loops, are a memory of the designer’s first time on holiday in Venice last year. A blue fleece overcoat is printed with a dancer in fourth position, poised for a pirouette – an ode to Akhavan-Moossavi’s years spent training in ballet, tap and contemporary dance. “It’s my final collection. Go big or go home,” he says of his 10-look-lineup. Some, though, are bigger than others, like the brick-red jacket printed with floating babies, sperm, spliffs, condom wrappers – all the necessary accoutrements of manliness – alongside sanitary towels and a woman in the throes of labour across the back; everything that’s both anodyne and taboo about everyday life. Akhavan-Moosavi’s shapes are tent-like, oversized and dominated by outerwear, with hockey player shoulders and too-long sleeves falling over the hands. Orange culottes, pointed at the hem, are printed with a man losing his phone in a drive-by mugging, while another, who bears a clear resemblance to the designer, pulls behind him the “baggage of manliness”. A softly tailored blue suit, printed with the yellow face of the moon and overlaid with sateen pink penises is a welcome break in the streetwear shapes. But a gargantuan intarsia roll neck jumper, blue with felted orange dicks (you could say there’s a theme) takes the cake. Falling bulkily below the knee, its weight totals that of a three-year-old child. 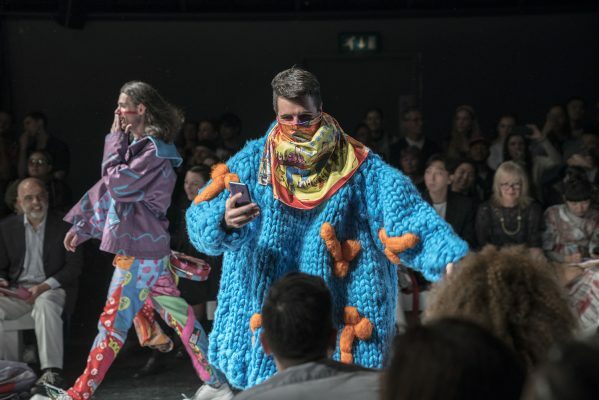 Given that the collection is about himself, it was only fitting that the designer closed his own show modelling this look, a silk scarf covering his nose and mouth, as he live streamed the catwalk on his Instagram feed. He paired it with lime green lycra leggings, printed with penises and brains – a mischievous allusion to the “workings of the male mind”. Akhavan-Moosavi has worked as an outreach officer for the University since his first year at Central Saint Martins. A genial, gregarious person, he’s on first name terms with everyone from the fashion faculty to the staff in the loading bay. And canteen. And the security staff…and so on. Part of his work with the University is teaching students who want to come to Central Saint Martins: “My job, and this university, has been such a huge part of my life for the last five years,” he says.